Personal dashboards are super useful. They tell us how we are doing at a particular activity and point to the next steps we need to take to improve. But not all dashboards are created equal – some are better than others. 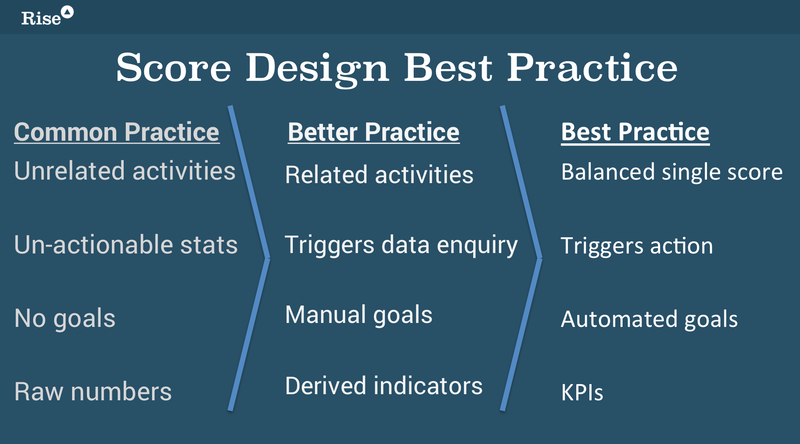 In this post I explain the 5 main design decisions you need to take when creating a dashboard, whether for yourself, your team or your application. By considering each in turn you will ensure you will create the best personal dashboard possible. We’ll go into each in detail but before we do lets have a think about why we need personal dashboards. Why do we need personal dashboards? The two types are important because the dashboard that you need when learning is different from the one you need when performing. Learning tends to be structured in a finite way – i.e. “complete these steps, learn this body of knowledge etc.”, and then you go on your way. Performing is different: improving performance is something both beginners and experts continue to do, it’s an infinite experience. Take learning to swim for example. When I first learnt to swim, the dashboard I needed would have ticked off my proficiency at the main stroke types and perhaps tracked my longest distance swum so far or my ability to tread water for 2 minutes in my pyjamas. Once learnt, I would have no further use for the dashboard. 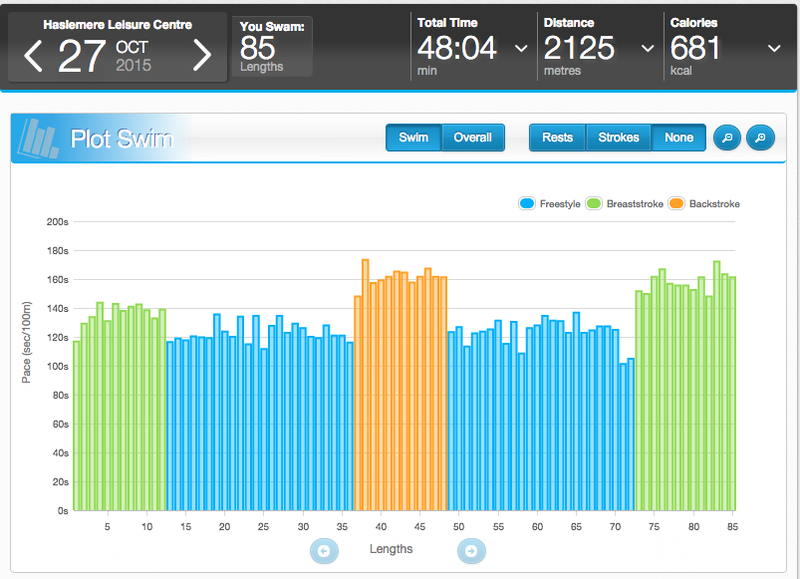 But as a swimmer, I want an ongoing dashboard that helps me optimise my swimming – am I maintaining the right calorie burn, is my front crawl getting faster over 200m? This is an infinite dashboard that I will continue to need as long as I swim. Who designs the personal dashboard? It could be my manager or coach – this is someone with direct line responsibility or influence over me – I might delegate the dashboard creation to them because they can see what the most relevant scores should be. 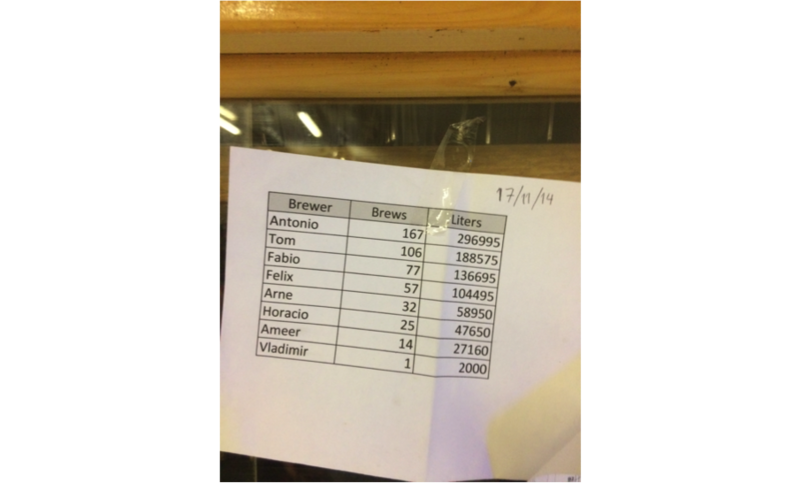 We see this in a Rise board where a manager designs the right scoring algorithm for the players and their objective. 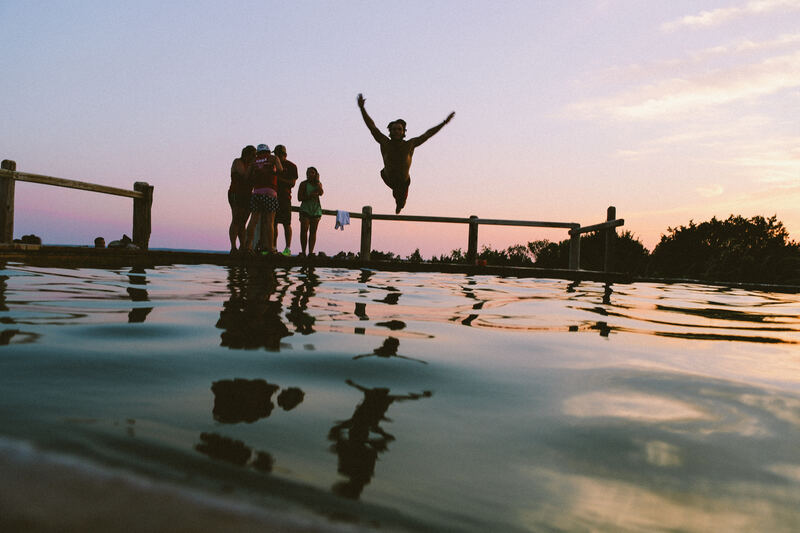 it could be a 3rd party app – like SwimTag above, or Fitbit or Google Analytics for a business. In general terms the further away the designer is from the player me the less flexibility the player has. However the plus side tends to be ease of use. i.e. It’s easy to use a 3rd party app, as I don’t need to think about what goes into my dashboard, it simply “is what it is.” Constructing my own, may take more time but does give me more flexibility. Who you choose as designer for your next dashboard will depend on your specific context. is the dashboard for measurement or scorekeeping? 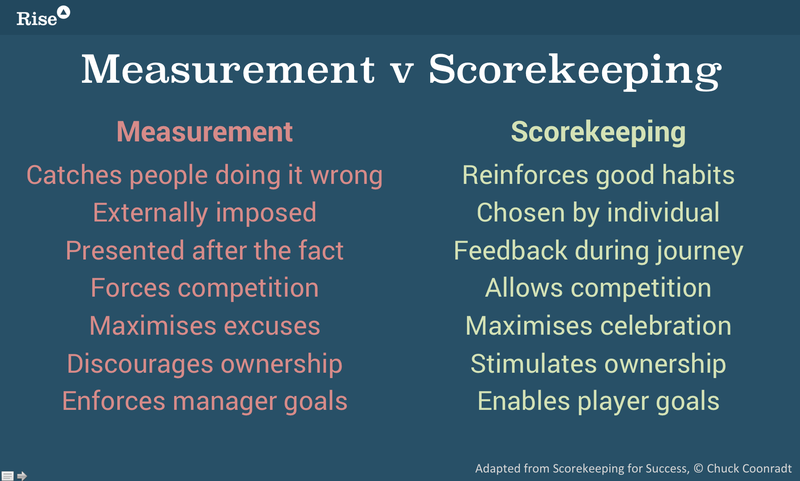 Measurement and scorekeeping are different business objectives and to flush out which category we are in we need to understand our role. Managers measure while players and coaches keep score. 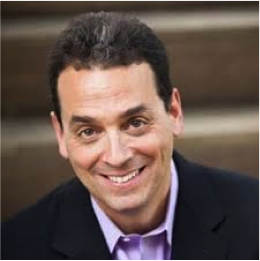 Measurement is what management do to track you, scorekeeping is what you do to track your own performance. Top down and bottom up is another way to think about it. Measurement is what the doctor does when he measures your height as a child, types the result into a computer and you never hear of it again. Scorekeeping is what your parents do when they put a book on your head and write a line on the wall so you can see how far you’ve grown this year. As dashboard designers we have to understand the core business objective that is driving the need for a dashboard. And,as designers, if we want engagement from our players then we need to lean as far as possible towards scorekeeping and away from measurement. All behaviour is predicated on rewards of some kind. However the nature of the reward will differ according to the type of program. Your Reward Strategy is your framework for this. For a finite learning activity, it’s fine to offer some sort of completion “carrot” – “complete my course and I’ll give you a certificate” – I call this a macro reward – it’s pretty big in the context, and I might not do the activity unless I receive it. The reason I go to University is to “get” a degree. For infinite dashboards, such as performance improvement, this macro reward approach starts to fail – it is expensive for us to continually hand out rewards (think of most loyalty programs) and we may be guilty of over-justification – by bribing someone to do something you can turn previously intrinsically motivated activities from “play “into “work”. The reality is that for infinite dashboards and ongoing engagement we need to focus our attention on the intrinsic rewards (“I want to be a better designer”) not on the extrinsic ones (“I want to earn more money”). To do this we use what I call “micro rewards” – small, relevant, usually non-financial, often social, rewards that help keep us motivated but are not so big that they distort our behaviour and upset our motivational balance. For example, I enjoy getting a note from my SwimTag dashboard that “I’ve completed a virtual English Channel in the equivalent of 14 hours” but that’s not the real reason I get out of bed on a cold Tuesday morning to go for a swim. I swim to get fit, for health and for enjoyment of the exercise. The fact that over the past 3 months I’ve swum enough lengths to have swum the English Channel is a “nice to have” but it’s not a “must have”. Let’s think about this some more. Why? Because it’s a key place many program designers (yes that’s you the marketing community) attempting infinite dashboard design go astray. If I offer a macro reward for a program – for example an Ipad – then yes, I will get a massive short term increase in all metrics that I’m measuring. Whoever tweets our hashtag the most gets an Ipad will result in a lot of tweets. However that also encourages “compers” – people who engage simply to win the Ipad not because they are engaged in the conversation that the hashtag refers to. In a work environment this can lead to gaming of the system or at worst cheating. Finally, the main criticism I have of macro rewards is that there is no engagement post campaign. Once the Ipad is handed out everyone goes back to their previous behaviour. You haven’t moved the dial or changed behaviour. A micro-rewards strategy is much more effective if you want ongoing dashboards and timely behaviour change forever. Take Nike Plus as a great example of this – the micro rewards are entirely virtual and localised to the player. 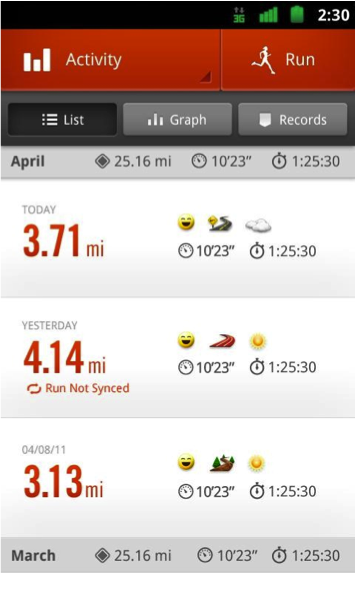 Feeback on my running times, map visualisations of your most recent run, comparison with friends on a leaderboard. It’s very smart marketing for Nike who have engaged runners with a branded personal dashboard without offering any of the traditional (and expensive) marketing incentives that might have distorted motivations – a chance to win free shoes for example. It takes discipline to avoid macro rewards but it’s critical to success. Score design is one of my favourite areas of dashboard design. It’s like Alice in Wonderland, the deeper you go down the rabbit hole the more wonders there are to learn. What time period will you cover? – do scores last for all time or will you only score for completing activities during the period? Or a combination of both? What ranking algorithm will you use? relative to others (1st quartile, ranked 5th, 6th etc) or absolute (2 tweets = 4 points) ? In the common practice of dashboards we see a host of unrelated stats displayed in a visually appealing way but is ultimately unactionable. They do not pass our test and they certainly do not trigger timely behaviour change. Here’s an example of Common Practice dashboard design – it’s a mess, with data related to sales and operations all on the same page. The different types of chart (bars, pyramids and doughnuts) may help the sales team promote the flexibility of the tool but they do nothing to reduce the cognitive load of the player who has to figure out what to look at first. Most dashboards of this nature are sold as “real time” but the reality is that people look at them once and never use them again. 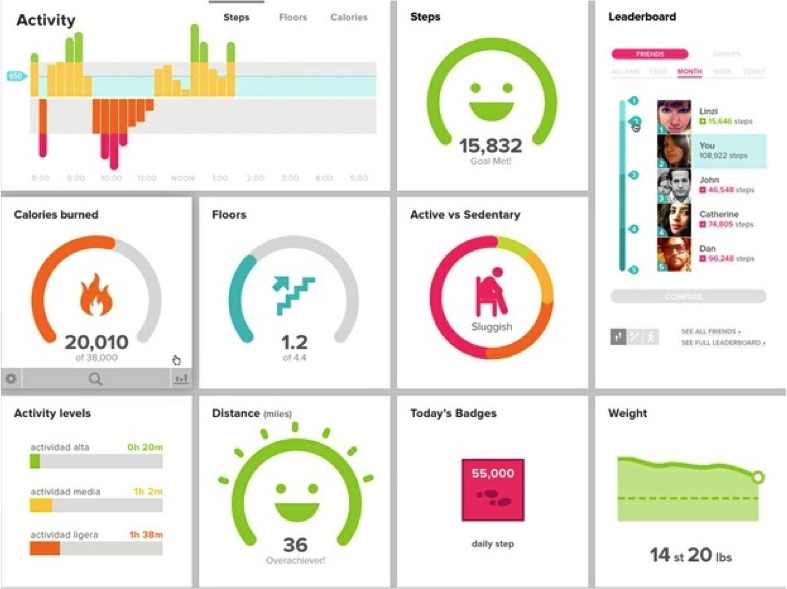 I rather like the Fitbit dashboard which is much better practice when it comes to dashboard design. While there are multiple scores in play (calories, steps and floor) they are all related so it does a much better job of providing an engaging and actionable dashboard. The daily time period is built into the dashboard and the friend leaderboard offers some easy to understand goals (“I’ve just got Linzi to beat”) and micro-rewards (“You’ve met your steps goal for the day”) for the players. Our final step change comes with the Rise Social Selling Club which champions a single composite score approach that is distributed weekly, directly to players. 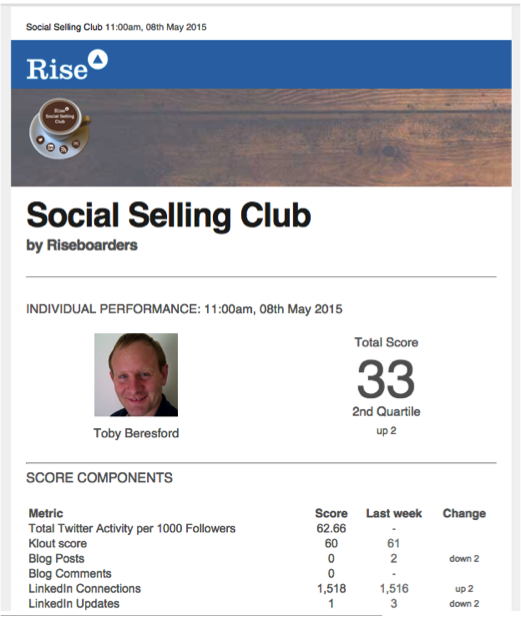 What I like about the Social Selling Club is firstly that all the activities are condensed into a single score between 1 and 100. that’s nice and simple to understand – all the relevant weighting between the various metrics is done for me. I don’t have to think “is it more important to post blog posts or build my twitter following” – the manager of the board, who is acting as my coach, has done the thinking for me. I simply have to look at the score and see whether last week’s activity sent it up or down and change next week’s behaviour accordingly. Other features you’ll note are the name of the board and the visual identity for the score which makes it engaging, similarly putting my picture on there makes me sit up and take notice. The leaderboard (more on this in the next section) is present but in this case downplayed (I am in the second quartile this week, need to pick up the pace obviously). Finally the underlying scores are built from KPIs as well as raw scores – I’ve got some key ratios that I need to keep an eye on if I want to be an effective social seller. As the dashboard designer it is up to you how you focus the player’s attention when it comes to comparisons. It might be that personal score (this week versus last week) is all that’s really needed – in which case we are only comparing against ourselves. Alternatively we might compare peers on a leaderboard – how am I stacking up against other people (or organisations) engaged in the same activity. If the pool of peers is too large it might be worth breaking it down further into divisions and leagues. Everyone prefers being a big fish in a small pond to being a small fish in a big pond. The final option is to focus on collective performance – how are we all doing as a team against our goals. The perennial fundraising thermometer showing how much total donations have been achieved so far and how far we have to go is a typical example of a collective performance dashboard. Leaderboard design is really important for driving engagement in your dashboard. If you get it right you can create engagement with the passion of the premier league, if you get it wrong you might actually demotivate people, so be careful! At a recent trip to the airport I spotted a dashboard for airport security staff showing “tray processing rate per scanner”. I asked one of the staff what he thought of the metric – “oh that’s something for management, not me” he huffed in reply. What a shame! If the dashboard designer had spent a few minutes on site or interviewed the staff themselves then they might have noticed that security staff operate in regular shifts. Why not change the metric to “tray processing rate per shift team” and show progress on a leaderboard – how much more engaging would that have been! We often hear that the medium is part of the message and nowhere is that more true than in the distribution channels you use to share your dashboard. I favour multi-channel distribution – making the dashboard available in more than one channel increases its likely impact and hence engagement from players. tweet – a public tweet (or yammer post if we’re inside the organisation) letting someone know their rank/score puts it out there for all to see. This public recognition of the score’s importance is highly engaging and attention grabbing. big screen – there’s nothing like a big screen up on the stage or in the lobby to really let everyone know which score they should be focusing on. Next time you spot a bad dashboard like this do please send it to me, I’d love to start a collection! By running your dashboard on a periodic basis instead of real-time it allows this kind of discrete push messaging (“your score this week”) which is super engaging for people. It’s always nicer to receive news about yourself than to have to go off and dig for it. If you are stuck with a real time dashboard then you can get around this by developing alerts. Alerts are also reasons to message someone – for example if they just passed someone on the leaderboard, or someone just passed them! Strava do this well on their cycling activity tracking app. Business Objective – top down or bottom up? Reward Strategy – macro or micro-rewards? Score Design – multiple or single score? Leaderboard Design – compare with self, or compare with peers? Distribution Channels – email, web, tv screen? I hope you’ve found it helpful and you’re now on your way to creating a great dashboard. If you’re ready to get started then I’ve produced a handy checklist of all the key questions which you can download for yourself. All it needs is your email so that if I do ever turn this into a book you’ll be the first to know! Finally, in the comments below let me know, which is your favourite dashboard that you use and why?